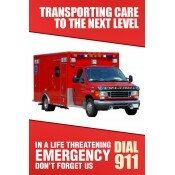 Custom ambulance magnets are an effective choice for promoting private ambulance services at a low price. 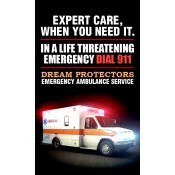 These promotional magnets offer better business advantage to small and mid-sized emergency ambulance services. It is a known fact that only strategic advertising can help ambulance services to compete with large businesses which have been operating over the years. 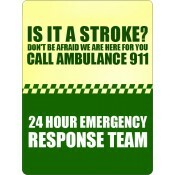 For building their visibility, small time ambulance services should start using these customized magnets. Made in USA magnets. The demand for ambulance services accelerated post-recession because many people were without private insurance policies and they waited until their health issues got worse. Over the next five years, these ambulance services are going to attend more calls due to the fast growing population of people aged 60 above. Do you know that in the US every 1.9 seconds someone is transported to the hospital by an ambulance?! Doesn’t that sound clinching and staggering. What does that mean for an ambulance service? It all indicates that ambulance services should remain prepared for emergencies. 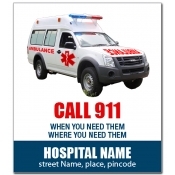 We offer a vast and thriving selection of personalized ambulance magnets, largely ordered, reordered and appreciated by various private ambulance services over all these years. 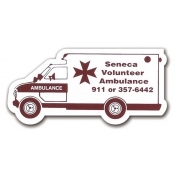 All promotional magnets in our selection are crafted over popular sizes of rectangle and square magnets as well as ambulance shape magnets. We also encourage our clients to try out positioning their business information over circle magnets, oval magnets and other vehicle shaped magnets. We offer free full-color printing on all our customized magnets which allow marketers to build colorful campaigns at no extra costs. They can use as many colors as they wish without worrying about additional set up charges. Apart from a free creative advantage, we also allow marketers to save on art setup, online design proof and shipping because their prices are included. 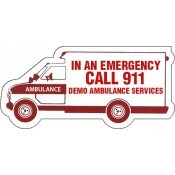 Customized emergency services magnets make great gift items throughout the year because emergency is always a hand away! Marketers can send these customized magnets as gifts during medical events, healthcare awareness programs, mass community events, private celebrations, individual celebrations and more. 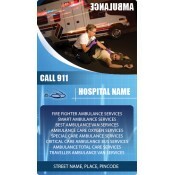 Save large on wholesale orders of these promotional emergency services magnets. To know more about customization and other details, feel free to call us at 855-762-4638 (Toll Free) or write to us at info@CMagnets.com.